When switching to alternative backgrounding and finishing diets, it is important to understand how each diet will affect the end product (lamb carcass quality). Those producers that are interested in entering the grass fed market should consider the production gains and losses associated with different forage diets and diet combinations. In order to compare alternative finishing diets on lamb performance and tissue accumulation (bone, lean, and fat), an experiment consisting of 5 different feeding strategies was conducted. 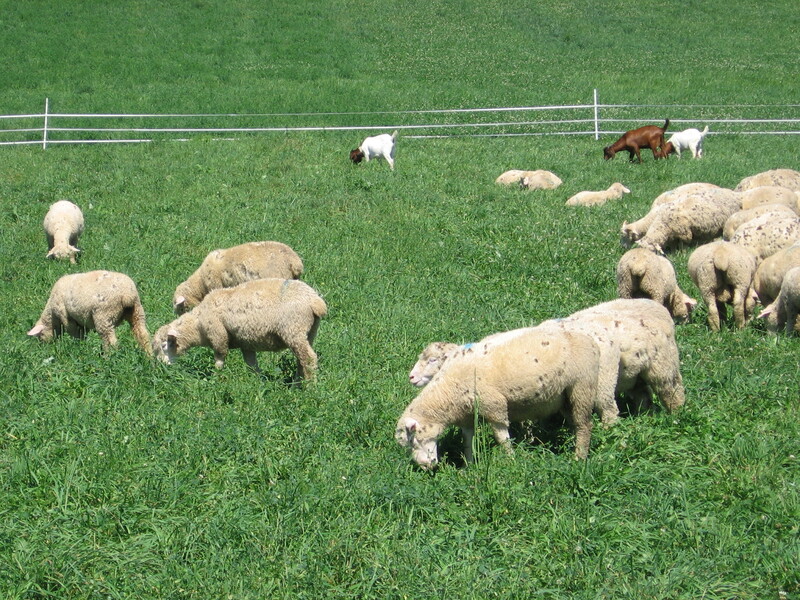 In this experiment, lambs were weaned and either placed directly into a drylot and finished on a high concentrate diet (DL), rotationally grazed and finished on alfalfa pasture (ALF), rotationally grazed and finished on ryegrass pasture (RG), rotationally grazed on ryegrass pasture for 62 days and then placed into the feedlot for the finishing phase (RGDL), or rotationally grazed on ryegrass pasture for 62 days and then grazed on alfalfa pasture for the finishing phase (RGALF). Lambs were slaughtered when fat thickness of the ribeye was estimated to be 0.15 – 0.22 inches via palpation rather than a targeted end body weight. Measurements collected included average daily gain (ADG), accumulation of bone, lean (muscle), and fat in the carcass, and final live body weight (BW). From a performance standpoint, DL treatment lambs had the highest overall ADG (0.8 lbs. ), with ALF and RGDL lambs being intermediate (0.5 and 0.4 lbs.) and RGLAF and RG lambs having the lowest ADG (0.3 lbs.). However, the ADG of RG, RGALF, and RGDL lambs prior to the finishing phase were not different. The final BW of RG and RGDL treatment lambs (114.4 and 114.0 lbs.) was greater than all other treatment groups. This may be attributed to the fact that lambs were harvested based upon back fat depth and not final body weight. Looking at days on feed, DL treatment group lambs spent the fewest days on feed at 58 days and RG treatment group lambs spent the most days on feed at 178 days. These numbers support that finishing lambs on grass pastures requires more days on feed when compared to concentrate fed lambs. From a carcass perspective, lambs in the RG treatment group had carcasses with more lean (muscle) weight when compared to DL treatment group lambs, but ALF treatment group lambs did not differ from either group. In addition, the lean:fat ratio for weight gain was greater in ALF and RG lambs when compared to DL treatment group lambs. Lambs in the ALF treatment group had less carcass fat when compared to DL, RGDL, and RGALF treatment group lambs. 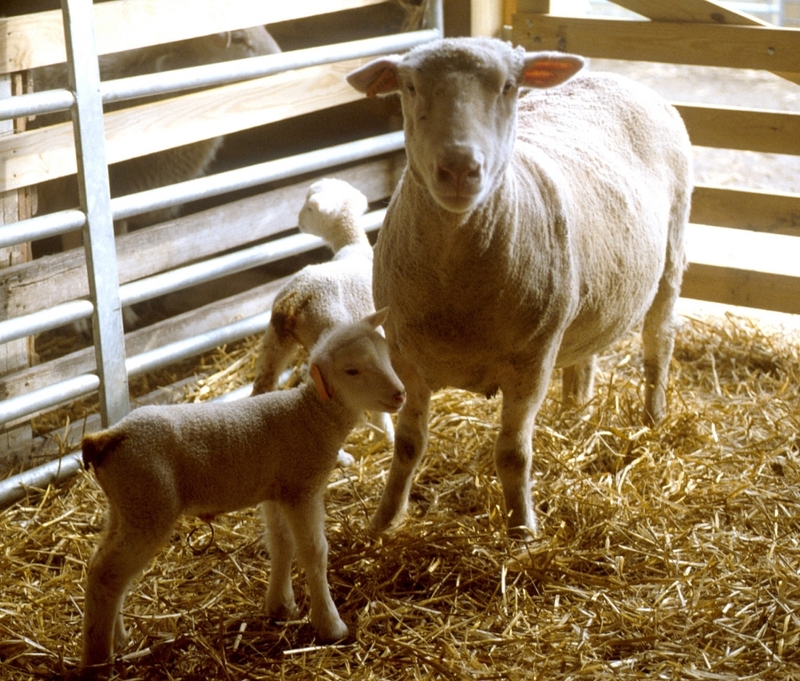 The above results illustrate that although finishing lambs on a high concentrate diet will result in a greater ADG and allow for producers to market their lambs at a younger age, concentrate fed lambs will also deposit more fat and produce less lean tissue when compared to forage fed lambs fed to the same back fat cover. 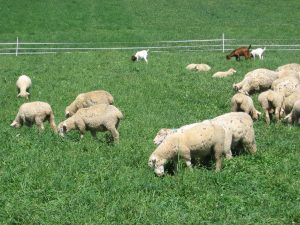 For those producers interested in pursuing the production of grass-fed lamb, keep in mind that forage fed lambs require more time on feed. However, forage fed lambs in this experiment resulted with a higher lean:fat ratio when compared to concentrated fed lambs. This information may be of benefit when developing a lamb for grass-fed lamb. Overall, the above feeding strategies provide producers with many options. Depending upon the availability of feedstuffs (grain and/or pasture) as well as the markets/marketing opportunities available to the producer will ultimately determine the feeding strategy that will be used on farm to feed lambs. McClure, K. E., M. B. Solomon, N. A. Parrett, and R. W. Van Keuren. 1995. Growth and tissue accretion of lambs fed concentrate in drylot, grazed on alfalfa or ryegrass at weaning, or after backgrounding on ryegrass. J. Anim. Sci. 73: 3437-3444. Posted by Braden Campbell at 8:00am January 4, 2019 Posted in Nutrition, Research and tagged Management, Marketing, Nutrition, Research. Bookmark the permalink.